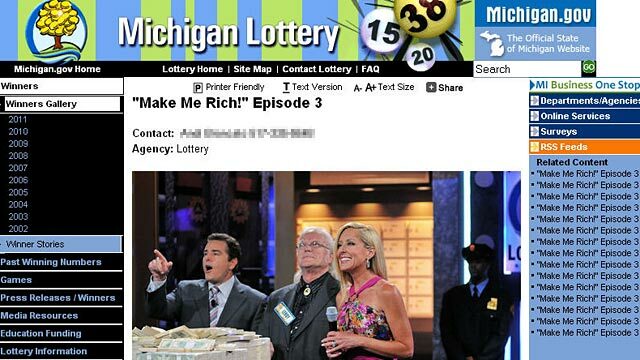 Leroy Fick of Auburn, Mich., won $2 million on "Make Me Rich! ", a Michigan Lottery game show. Leroy Fick hit the jackpot. The Michigan man won $2 million in the state lottery's "Make Me Rich" contest last June. With the $850,000 he took home after taxes, Fick, 59, used his winnings to purchase a new home and a used Audi convertible. But to buy groceries, this lottery winner is still using his Bridge Card, Michigan's version of food stamps. In fact, Fick said he contacted Michigan's Department of Human Services after his lottery win to ask if he could still use his Bridge Card. "They said I could go ahead and keep the Bridge Card if I wanted to," said Fick. "This angers me. It really makes me angry," said Rep Charles Brunner, who represents Fick's hometown of Auburn in Michigan's 96th District. "The thing that really bothers me is [that] in our state we have so many people out of work ... so many people in need of assistance, and for a lottery winner to get food stamps" is unfair, Brunner said. "If it's a glitch in the law, we've got to fix it now." Today, Brunner introduced legislation in the Michigan House of Representatives calling for the state to factor in the assets of food stamp applicants, not just their income. Lawmakers are now scrambling to close that loophole. "We are actively seeking a change to the food assistance policy to see that only those who are truly [in] need qualify," said Gisgie Gendreau, a spokeswoman for Michigan's Department of Human Services. Fick's attorney said his client will stop using his Bridge Card if Michigan changes its policy, and doesn't feel bad about using the taxpayer funded program because Fick just paid more than $1 million of his lottery winnings in state taxes.